McMurdo’s Camp calls home the Lumber Camps of Michigan, in Charlevoix County. One of the features of living in a wooded area, as we do, is the abundance of “forest fungi”, some of them edible. 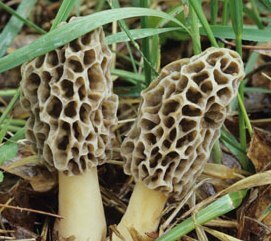 In Spring, usually mid-May, we hunt the elusive Morels (Morchella esculenta and elata). In years we are fortunate enough to find lots of them, we saute’ them in butter or olive oil, freeze them, and enjoy them throughout the year. 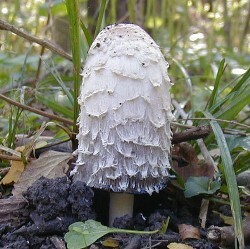 Then in autumn, September/October, there is greater fungal variety, but being cautious types we stick with one we know, the peculiar Shaggy Mane (Coprinus comatus), which has to be picked and cooked expeditiously lest it digest itself and turn into black slime. Both the Morels and the “Shags” are rated “choice” among the edible mushrooms of North America. In any discussion of picking and eating wild mushrooms it is important that advice be given upon the subject. There are lots of poisonous mushrooms out there. For any species, poisonous or not, appearances vary from specimen to specimen, and during different stages of development and growth. Some edible types have “evil cousins”, so it is up to the individual picker/eater to be sure that what is collected and consumed is actually safe. Reading and looking at pictures is not always the answer. And if you ever wondered what it’s like to be poisoned by mushrooms, you can read about it here. It is instructive to note that the initial digestive symptoms, while highly unpleasant, fade away in a few days, but this respite is temporary. While the victim may be hopeful of recovery, this is a false hope, as by then the deadly poisons are destroying the victim’s liver even as the discomfort in the GI tract diminishes. Since McMurdo’s Camp is a Sherlock Holmes web site, what is a discussion of mushroom picking doing here? To find a connection, however tenuous it might be, we have to take a look at some of the aforementioned “bad guys” of the fungus world. Eat ’em and die! Some have colorful names. How about munching on Fly Agaric (Amanita muscaria), a Death Cap (Amanita phalloides), or a Jack o’ Lantern? In the first Sherlock Holmes story, A Study in Scarlet (STUD), Part 2, John Ferrier and his adopted daughter, Lucy, were being pursued by her two Mormon suitors, Stangerson and Drebber. The Mormon leadership in Salt Lake City had decided the rich and beautiful Lucy should marry one of the sons of the elders, and gave her 30 days to make her choice. She didn’t want either one, so she fled, at the last minute, with her father, and gentile fiance’ Jefferson Hope. The party was pursued by some violence-prone Mormon enforcers, called The Avenging Angels. While Hope was out hunting for food, the Angels murdered Ferrier and kidnapped Lucy and took her back to Salt Lake where she was forced to marry Drebber. She pined away and died not long after, inspiring Hope, her fiance’, to vow revenge, leading to the events in one of Holmes’ earlier cases, the first ever recorded by Watson. The connection? The deadliest of the poisonous mushrooms, A. phalloides, often called the Death Cap, is also commonly known as Avenging Angel, which was the name given by Conan Doyle to the Mormons who caught and murdered John Ferrier, and kidnapped his daughter. Since Doyle’s time, there has been some small controversy over his depiction of the Mormons. The Mormons, in general, deny that any such behavior ever took place in Utah. Doyle, in his later years, once visited Salt Lake City and made something of an apology. It is, however, an historical fact that there was a vigilante group called the Danite Mormons, formed in 1838 in northwest Missouri during some dissension in the Church over land use and organization, which was known as the “Mormon War” (wasn’t much of a war). Whether or not the Danites’ organization lived on to cause trouble on a wider scale in later years, as was and still is often rumored, is a question of some historical debate. We will leave resolution of this question up to the historians, but we all know Doyle’s descriptions of the “Alkali Plain” were not encumbered with great accuracy. Noisome and grievous sores upon the men which had the mark of the beast. The sea would become as the blood of a dead man; and every-thing within it would die. The rivers and fountains of water would turn to blood. The sun would become very hot, scorching men with great heat. The world would become dark; with men gnawing their tongues for pain. The water in the great river Euphrates would dry up. Voices from Heaven would fill the air, there would be thunder and lightning and a great earthquake. Cities and nations would fail, islands and mountains disappear, and a hail of large stones would fall upon those men who had blasphemed God. Pretty serious stuff. No-one at McMurdo’s Camp feels qualified to comment on the theology here. We understand that if you took all the Scholarly experts in the world and laid them end-to-end, they still would not reach a conclusion on the significance of all this. We do know Conan Doyle was religiously schooled, but later rejected that part of his upbringing. 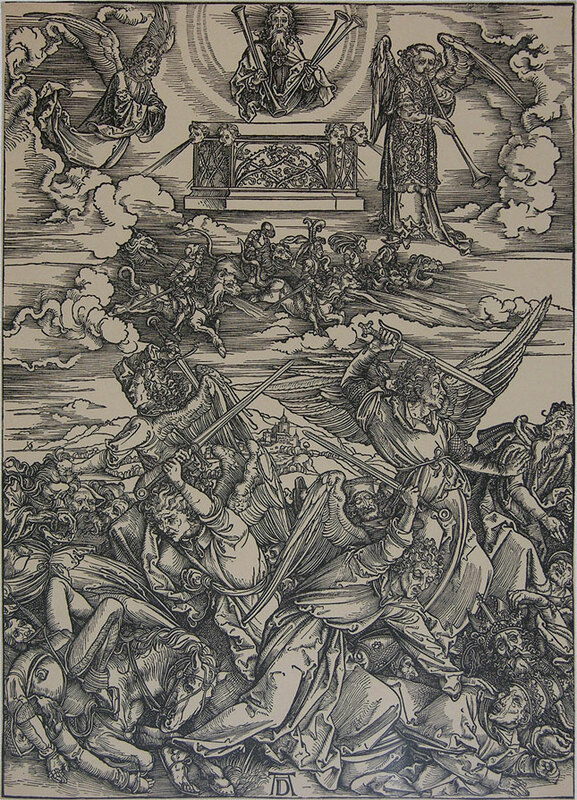 There are some other examples of the term “Avenging Angels” in the modern world. The Liverpool rock band, Space, which lasted from 1993 to 2005, had a minor hit song called Avenging Angels. There are some Marvel comic-book superheroes called the X-men, one of whom has functional feathered wings growing out of his back, and is called The Avenging Angel. There is also a computer game called “Requiem: Avenging Angel” which reviewers called “wonderfully twisted”, which is considered, in that field, to be an attribute. There have also been a couple of movies called Avenging Angels(s) made, one recently, and one about 25 years ago. And finally, a football team. The Algonquin Avenging Angels. (No, a lie. Sorry; we just made that up. But wouldn’t it be great?) Sometimes however, reality rivals a tall story. There is an organization called the Womens (sic) Football Alliance, a league made up of six semi-professional women’s teams in Michigan, Ohio, and Pennsylvania. One of the teams is the Detroit Dark Angels. Close enough! Take a look at the logo. Red eyes. Is that a little blood dripping from her mouth? Are those white marks on her lips supposed to represent the cosmetic gleam of lip gloss, or they sharp little teeth? No photos, thanks. That article was about as close to being a mushroom site as want to be. However, there is plenty of good info out there. One we like is Tom Volk’s site, http://botit.botany.wisc.edu/toms_fungi/. It is written by a mycology professor but while filled with information, is as far from dry and scientific as you could get. And we think one problem with the Avenging Angel is that it is so common-looking, unlike the Fly Agaric you mention.